Here is what you need to know about the Roof Wizard Software, to help your metal roofing and cladding customers. We are serious about metal roofing. We always have and always will base our software development on direct input from best, current industry practices. Every function of the software exists because it can add value to our (and your) clients’ bottom line. 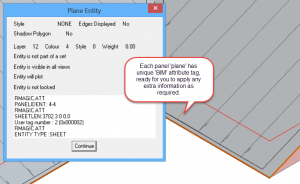 You create the individual panel, with individual panel attributes (with the ability to add all sorts of extra attributes to fulfil the expected needs of a BIM model). Then, you only model the outside edges because you only need the outside edges to extract a cutting list. We are not concerned about the overall panel width, we are concerned with the panel cover width and the exact length, long point to long point. 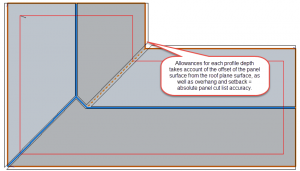 Offsets controlled by an allowance file associated with each profile provide absolute control over the generation of accurate cutting lists. In the illustration below we used 10″ or 250mm panel thickness for emphasis. In some climates, you might even use such a panel depth! Each panel knows all there is to know about itself. Provided a site check measure has been done prior to ordering on the factory. 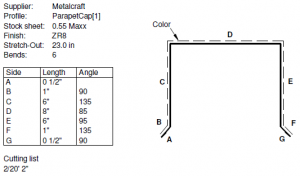 The cutting list length is the correct length if the correct allowances for that profile have been used. You can have, indeed you must have, a unique allowance file for all your profiles and variants as described above. You will have a definition for each panel variant, with a different product code to uniquely identify that panel, its cover width and its cost. A few of our clients have been using Roof Wizard for panel production for over 15 years. The process even cuts each panel on the angle for each hip and valley of a complex residential roof. Each panel is also printed with its unique ID and length as it comes off the line. 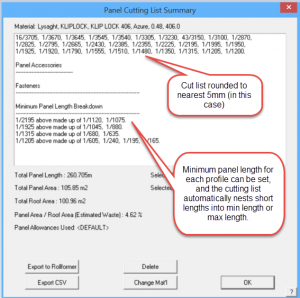 The Roof Wizard directly exports the cutting list information in the correct format for the machine controller – you will have no mistakes from manually keying in cutting length data. A panel sequence drawing may be produced, allowing production guys to check the panels off as they come off the line. No mistakes. (this list is in metric units – of course you can also also have it in inches only or feet and inches!). The cutting list is able to nest short panels automatically, so they don’t fall through the rollers in the line. It the also informs the contractor what panels need to be cut on site. These are just some of the production, fabrication and installation aid documents that we extract from Roof Wizard software, automatically, from the 3D model using your panel definitions. Indeed, yes it does, and for the majority of work, the installation guides well and truly document these details. 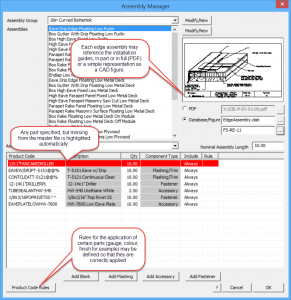 The Roof Wizard Commercial Mode references every single one of these documents in the context of the edge assembly to be installed – automatically, using our Assembly Manager function. You can apply custom or bespoke flashing, gutters and trim to an assembly and in each case, the software then extracts a fabrication detail for each profile. We hope this article explained the sophisticated processes we have developed for you to improve accuracy, efficiency and profitability. We are very confident that our Roof Wizard software provides the tools you require for the majority of your metal cladding projects. Once the client proposal is accepted, a range of material ordering and production information is produced, and then additional information to ensure the most professional level of installation. All inventory and cost information may be exported for easy exchange with your ERP and business management systems. By the way, you can export the 3D geometry with complete attributes to other systems, too. Roof Wizard is the most complete package for the roofing and (!) cladding industry in the world today. Here is a sample of another output, one we call the Section Report. 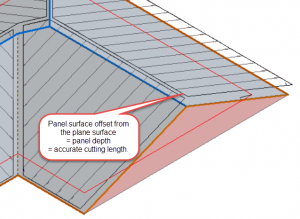 It is a very useful document to help installers put the panels in the correct location on the roof.